!!! PATCHMASTER version 2x90.5 cannot open or export the old PULSE / POTPULSE data files any more. !!! When selecting an Analysis Function in the Analysis dialog, the corresponding cursor pair is shown in the Oscilloscope Window. When exporting traces to Igor Pro, corresponding markers are now exported as "Tags" with the traces. A new (linear) calibration mode was added to for "TILL Photonics"-like light sources (for converting volts to nm and vice versa). The option "Cursor Bounds %" in the Analysis dialog could only be changed in 10 % steps by dragging. Fixed in v2x90.5. The "SetValue" command returned wrong results if it was used for retrieving amplifier parameters. Fixed in v2x90.5. The digital input control was only updated while a PGF sequence was running. Fixed in v2x90.5. !!! PATCHMASTER version 2x90.4 cannot open or export the old PULSE / POTPULSE data files any more. !!! Most Analysis functions inherit the unit of the result from the analyzed trace. For example, the Mean analysis function returns a value in [A] if a current trace is analyzed and the unit is [V] for voltage traces. However, some analysis functions (e.g. Math functions) are not Trace-based. In previous PATCHMASTER versions, those results were shown without any unit. PATCHMASTER 2x90.4 allows for manually entering a unit for these functions. The Scan Modes "Pullup Scan", "Depth Scan" and "ZTrack 3D" were implemented. The new export functions to IGOR "3D Scan Export" and "Matrix Export" were implemented. A Deconvolution function was implemented. Running scans can now be aborted via the "Break" button in the Control Window. Focus Motor Axis (FF) option was added to the ElProScan event in the Protocol Editor. 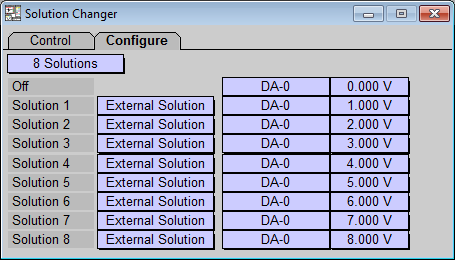 In the default configuration only 6 protocols are shown at the same time in the Control Window dialog. If one needs direct access to more than 6 protocols, one can display up to 5 additional rows of Protocol buttons in the Control Window dialog. Protocols then can be assigned to these buttons. In previous versions, no protocol could be assigned to the last of these buttons. Fixed in v2x90.4. Starting with PATCHMASTER 2x90.3 the data file format was changed in order to be compatible with our PATCHMASTER NEXT software. Data files recorded with older versions need to be converted to this new file format. This is done automatically when opening the file in PATCHMASTER 2x90.3 or 2x90.4. Before converting the file, a backup is created. If such a backup file already existed, the the same file could not be converted a second time. The current version allows converting the file even if a backup file already exists. Fixed in v2x90.4. The Digital Input item was only updated while a PGF acquisition was running. Fixed in v2x90.4. !!! PATCHMASTER version 2x90.3 cannot open or export the old PULSE / POTPULSE data files any more. !!! The File Format Version number was changed from "9" to "1000" to make it compatible with PATCHMASTER NEXT. The amplifier settings are now always stored in a separate "*.amp" file (which is part of the DAT bundle file). In previous versions, such a separate file was created only for EPC/n amplifiers. It is now possible to open such a data file in "Open Modify" mode regardless if a single amplifier or a EPC/n amplifier is used. Upon opening an older PATCHMASTER data file, this file is automatically converted to the new file format (a backup is created before converting the file). The Windows Scaling option was removed. The Batch Communication Mode cannot be changed while SmartLUX or DocuLUX is active. This prevents user from accidentally deactivating the Batch Communication. The default setting for CC-Gain was changed from 0.1 pA/mV to 1 pA/mV. The entry "TILL Photonics" was renamed to "TILL Photonics / Cairn OptoScan". When selecting "Load From File Template" the "DA-Scaling" and "StimScale" option are turned "Off" for this channel. The input trace labels for Photometry and Imaging have been renamed: "Photometry Wave" to "Photometry" and "Imaging Wave" to "Imaging". If "Use for Camera Trigger" is selected for the output channel then the channel timing for this channel is set to "Separate Timing". Under certain conditions, a Zero Subtraction cannot be performed online. Under these conditions, the message "Conditions not met for continuous acquisition" was written to the Notebook window and the Zero Subtraction (Display menu) was permanently turned off. The Zero Subtraction is now only disabled for this acquisition but is NOT turned off in the Display menu. The number of sweeps is now limited to "1" in the Gap Free Mode if the channel uses a "Continuous" Segment Class. The label of the check box toggled between "low" and "high". This label is now always fixed to "Checked = HIGH". The option "Auto Stim Control: Assigned" in the Analysis window was removed. X- and Y-scaling options are no longer blocked during acquisition. The "Redraw" button was removed. The Analysis function "Y(x): y at pos = x" was moved from the "Math" column to the "Measurement" column. The option to change the Tic direction in Analysis Graphs was removed. The "Text" or "Label" buttons to enter or rename labels in the Replay Tree are now automatically enabled or disabled depending on the selected data tree level. Export options are now only displayed if the export options are really available. Line Feed and Carriage Return options were removed from the ASCII Text Format menu (CR, CR-LF, LF Only). The option "IGOR Info File" was removed. Group, Series, Series and Trace labels are now read-only. The labels can be edited in the Replay Tree dialog. The number of User Parameters was extended from "2" to "10". The support for the DocuLUX extension was added. The new option "Include Analysis Headers" was added in the "Misc." tab of the Configuration. Disabling this option allows to suppress the display of Analysis Headers in the Notebook window. The function to select the read-out rows of the image was added which allows now to support the AOI feature of modern scientific cameras. Especially for Rolling Shutter cameras, the readout time depends on the number of rows to read from the sensor. Reducing the number of rows can increase the frame rate. The number of available Binning modes (and the corresponding labels) is now transfered from SmartLUX to PATCHMASTER and listed in the Imaging Parameters dialog of the Pulse Generator. The DocuLUX Event was added to the Event pool. For the Break Alert source the user can now define labels for the two options "Break" and "Continue". The CC-Gain option of "100pA/mV" was missing in the Amplifier Info dialog. Fixed in v2x90.3. The options "Join Unit" and "Split Unit" were shown for non-"EPC 10 USB amplifiers", too. This option is only available for EPC 10 USB amplifiers now. Fixed in v2x90.3. Upon switching from Voltage Clamp to Current Clamp mode, the new "I-holding" was set before actually switching to the Current Clamp mode. This resulted in a huge transient which might damage the cell. Fixed in v2x90.3. Saving the usage of a stimulation sequence as a Test Pulse sequence causes an error message during the next re-start of PATCHMASTER. Fixed in v2x90.3. Using the "Shift" key and the "Center" button in the Oscilloscope window to center all traces crashed PATCHMASTER. Fixed in v2x90.3. The list of Camera Trigger outputs (DA / Dig output channel) was mixed up. Fixed in v2x90.3. It was possible to set the Segment Classes "Chirp", "Sine", "Square" and "Ramp" in combination with digital output channels. This is now disabled. Fixed in v2x90.3. After moving PGF sequences the focus (selection) did not move along with the moved PGF sequence. Fixed in v2x90.3. The calculation of the minimum sample interval was not always computed correctly for a given number and/or combination of AD inputs when using an EPC 10 USB amplifier or an LIH 8+8, particularly if 2 units were used. Fixed in v2x90.3. When using the Gap Free Mode in a stimulation sequence it could happen that the temporary stimulus file created by PATCHMASTER exceeded the 2 GB limitation which ended in a crash of PATCHMASTER. This is now checked before the temporary stimulation file is created and in case of need this gets prevented. Fixed in v2x90.3. The HT-Template function did not work. Fixed in v2x90.3. When creating invalid stimulation sequences PATCHMASTER complained that there are multiple errors and further asked if you want to disable the checking. If you left the Pulse Generator window in that condition PATCHMASTER went into an infinite loop. Fixed in v2x90.3. After executing a stimulation sequence with several sweeps a digital line that was used in that sequence was set to "High" after each sweep. Fixed in v2x90.3. The "Filename" field of the Export event was ignored. Fixed in v2x90.3. Selecting a new "Cursor Source" for an Analysis function had no effect. Only after changing the cursor range of the new source function, the range of the target function was updated. Fixed in v2x90.3. Copying an Analysis Method containing 2 Analysis functions (and 4 Amplifiers) resulted in a new Analysis Method with 8 Analysis functions. Fixed in v2x90.3. Under certain circumstances it happened that the grid color of the Analysis Graphs adopted the color of the trace. Fixed in v2x90.3. If a data file is open in "Modify" mode and one loads an "*.onl" file PATCHMASTER crashed upon updating/closing the data file. Fixed in v2x90.3. When setting the "Threshold Crossing" function to "Positive Crossings" and the threshold to a negative value PATCHMASTER crashed while replaying data. Fixed in v2x90.3. Using "Adapt to Position of Function" caused conflicts in Cursor adjustment. Fixed in v2x90.3. The selected "Cursor Bounds" were not applied if one used it in conjunction with the Segment Offset function. Fixed in v2x90.3. After acquiring data with Markers and unbundling the file afterwards the Marker file was not read any more. Also when bundling the file again the information from the marker file seemed to be lost. Fixed in v2x90.3. !!! PATCHMASTER version 2x90.2 cannot open or export the old PULSE / POTPULSE data files any more. !!! The Hardware selection list was split into Amplifier, Interface, Board Type and Demo Mode selection. The "Undo" button was removed. The empty buttons in the PGF Pool were removed. To create a new PGF sequence the new "New" button has to be used. "apply StimScale" is now always active for StimDACs. For other DACs, "use DA-Scaling" is always on. The list items for controlling these settings are now disabled. "use for Imaging" was renamed to "use for Camera" in order to make clear that this channel is used for triggering the camera and not for controlling the wavelength of the light source. The DA and AD selection lists do only show now the available DA and AD channels. Unavailable DA or AD channels are not listed any more. The Leak Pulse settings are now hidden by default. They get active if the Leak Subtraction is activated for a recorded trace. The "Copy" button was added to copy the selected Analysis Method. The empty buttons in the Analysis Pool were removed. To create a new Analysis Method the "New" button has to be used. "Autoscale after Sweep" is now default for new analysis graphs. The options "Show Labels", "Nice Values", "Use TraceColor" and "Graph Overlay" are now default. The "List" button was removed. The "Copy" button was added to copy the selected protocol. The "Merge" button was added to merge two protocols. The empty buttons in the Protocol Pool were removed. To create a new protocol the "New" button has to be used. It is now allowed to execute 'Blocking Protocols' from the Amplifier window. The 3 Electrode Mode does now only show up in the Amplifier window when activated in the Configuration dialog. The filter in the Replay window is no longer case-sensitive. The LockIn Mode selection was splitted into LockIn Mode and Phase Range selection. The Motor Calibration can now be started from the ElProScan menu. The Join and Split functions are now accessible from the Amplifier menu. It is not necessary any more to use the Calibration software for this purpose. The "Set DAC" event was extended. It is now possible to use values, analysis results, amplifiers as source for that command. Furthermore, the "Use DAC scaling" option was introduced. If this option is active then the given value is multiplied by the DAC scaling factor specified in the Configuration dialog. The "Zero Offset" function has been added to the Function Type dialog. It returns the calculated Zero Offset value. The "Lockin_Ampl" function has been added to the Function Type dialog. It returns the amplitude of the LockIn sine wave. Re-Initializing the hardware resets all DACs to 0 V but the DAC display in the I/O Control Window was not updated. Fixed in v2x90.2. In Remote Mode it was not possible to use the Low Gain values. Fixed in v2x90.2. The C-Slow Compensation Range of "1000 pF" should be disabled in High Gain range. Fixed in v2x90.2. In the Rpel function, the value of the "peak_volts" constant was reduced from 8 to 1 since 8 caused the amplifier to saturate with high resistance (> 1.5 MΩ). Fixed in v2x90.2. The label 'Axon 200' was replaced by 'Axon 200B'. A new bandwidth table was added for the Axon 200B. When selecting the Axon 200B in the Configuration dialog the Axon 200B lookup tables are loaded instead of the lookup tables for the older Axon 200A amplifier. The 'Vmon In Scale' scaling factor is now set to "0.1" instead of "0.02". Fixed in v2x90.2. The new batch command "SetPulseMode mode" is now independent from the index position of the mode in the list. Fixed in v2x90.2. The command for creating a new data file now automatically turns off the test pulse. Especially, if a PGF sequence is used as test pulse closing and re-opening a data file could crash PATCHMASTER. Fixed in v2x90.2. "ExtStim" (External stim input scaling factor) parameter to "GetEpcParams" command was missing. Fixed in v2x90.2. Setting a new DAC value in the I/O Control dialog now also updates the DAC holding in the Pulse Generator. Fixed in v2x90.2. If the increment mode of a segment was set to "dV*Factor" or "dT*Factor" then this mode was changed to "V*Factor" or "T*Factor", respectively. Fixed in v2x90.2. The Start Segment could not be set to "1" as long as the Start Time was "0.0". Fixed in v2x90.2. Zero subtraction was not considered for the Break Condition. Fixed in v2x90.2. Activating P/n leak subtraction did not set automatically the leak storing method to "Store Average". Fixed in v2x90.2. The Pulse Generator dialog was not initialize if it was open when storing the Configuration. Fixed in v2x90.2. Using the "Trunc" function in the Photometry Parameters dialog switched to another PGF sequence. Fixed in v2x90.2. When trying to export the Analysis Graphs of a Power Spectrum the application crashed. Fixed in v2x90.2. Analysis cursor were not available in Multichannel mode if trace #1 did not exist. Fixed in v2x90.2. The number of Analysis Graphs were accidentally set to "16". The number of Graphs was set back to "12". This is the maximum number of Graphs that can be stored in the data format. Fixed in v2x90.2. The trace function "Q = Integral" might not be plotted due to NANs in the trace. Fixed in v2x90.2. The "Set Filter" event did not work for Buffer traces. Fixed in v2x90.2. When setting the holding potential of the amplifier, a wrong DA value was displayed for the StimDAC. Fixed in v2x90.2. The DAC holding was not stored with the Trace parameters. Fixed in v2x90.2. When creating more than 8 new data files the application crashed. Fixed in v2x90.2. The export of stimulus traces to the Matlab format did not work. Fixed in v2x90.2. The export to WMF, Info File, and Printer did not work. Fixed in v2x90.2. The suggested file name in the file selector was not updated. Fixed in v2x90.2. !!! PATCHMASTER version 2x90.1 cannot open or export the old PULSE / POTPULSE data files any more. !!! The ShearForce is used to detect changes in the height (thickness) of the substrate. 3 Piezos can be used to compensate for drifts of the motor stage. During these scan modes only 3 Piezo axes of the Piezo stage are moved. The motor controller is not required. The Hamamatsu Orca Flash 4 is now supported. The option "Auto Ranging" could not be turned off. Fixed in v2x90.1. The Solution file was not loaded. PATCHMASTER always came up with the default Solution file. Fixed in v2x90.1. If the Trace Assignment did not fit to the one in the Analysis a warning was written into the Notebook window. Fixed in v2x90.1. If either "Wipe Osci" or "Wipe Analysis" was checked, both check boxes were checked after reloading the Protocol Editor file. Fixed in v2x90.1. An error message did occur if either the Internal or External Solution index was set to "0". Fixed in v2x90.1. Under certain conditions 18 Analysis Graphs / Graph Positions were available. Fixed in v2x90.1. Some minor bugs in the Test Pulse Modes were removed and the Test Pulse Modes were rearranged. Fixed in v2x90.1. The "Time Constant" selection was disabled in the Current Clamp Mode. Fixed in v2x90.1. If the selected "Parent Trace" did not exist PATCHMASTER crashed. Fixed in v2x90.1. The calculation of the maximum number of scan positions was wrong. Fixed in v2x90.1. The menu selection "Auto RS Comp Settings" was not listed. Fixed in v2x90.1. If the "I-Scale" value of the Test Pulse was negative "***X" was shown in the Oscilloscope window instead of the scaling value. Fixed in v2x90.1. Rebuilding a data file failed. Fixed in v2x90.1. The C-Slow Compensation controls of the EPC 800 USB amplifier (Local and Remote Mode) are accidentally disabled. !!! PATCHMASTER version 2x90 cannot open or export the old PULSE / POTPULSE data files any more. !!! The option "Show Tree Info" was moved from the Replay menu to the Display menu. The PULSE v8.6 export mode has been removed. PULSE data files can no longer be opened in PATCHMASTER. 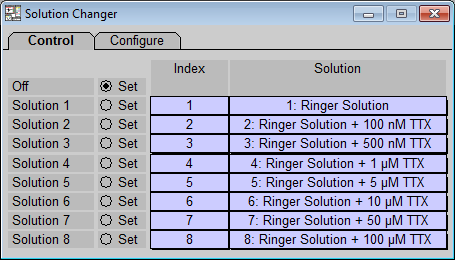 The Solution Changer Dialog was added. This dialog helps to configure the digital or analog settings of your Perfusion System. Further it links to the Solution Base to track the solutions used during the experiment. A new Break Condition ("Break if abs >") has been added. This option stops the acquisition, when an absolute sample value of that trace exceeds the given threshold. New options to generate the Auto Filenames have been added. For me details see PATCHMASTER Reference Manual. The new option "Sort" will sort the data according to ascending x-values. This option should be active if non-ordered, non-continuous traces should be ordered before the operation "Save to Tree" is performed. The displayed V-mon bandwidth was incorrect, when the filter response was changed for the first time from current filter to voltage filter. Fixed in v2x90. The "Auto Filter" can now handle several situations, e.g. when Filter2 is filtering I-mon or when Filter2 is either on bypass or filtering V-mon. In the later case, Filter1 is set according to the frequency bandwidths which Filter1 can define. Fixed in v2x90. If the option "Extended Stimulus Range" has been used the set holding current was 5 times too small. Fixed in v2x90. The CC-gain selection "100mV/pA" was not disabled for the EPC 9. Fixed in v2x90. The Solution Base was not active by default. Fixed in v2x90. The "Scan" function did not work properly for parametric data. Fixed in v2x90. When "Continuous Redraw" was active a zero-line was drawn only for the first trace. Fixed in v2x90. If the name of a PGF-sequence was exactly 31 characters long, and it was copied to an "Acquire Series" or "Acquire Each Sweep" event, then the last character was lost, causing the sequence to fail to start. Fixed in v2x90. A partially acquired sweep was not saved after a "Break Key" stopped the acquisition, irrespectively of the status of the "Save after Break" setting in the configuration. A partially acquired sweep is now saved, if the "Save after Break" option is active. Fixed in v2x90. Using the event "Set Solution" could crash the application. Fixed in v2x90. The "Amplifier" event for the iTEV 90 was not loaded correctly. Fixed in v2x90. The "Window Scaling" interfered with the proper display of protocols. Fixed in v2x90. While running a Protocol Method the corresponding event parameters have not been masked completely. Fixed in v2x90. The proper loading of the token "TRUE" or "FALSE" failed. Fixed in v2x90. The acquisition froze if one was using decreasing stimulus durations from sweep to sweep while Continuous Redraw was active. Fixed in v2x90. After saving the data of an Analysis Graph to the Replay Tree ("Save to Tree"-Function) they were incorrectly scaled after an re-analysis. Fixed in v2x90. After saving Analysis Graph data to the Replay Tree ("Save to Tree-Function") the cursor bounds for parametric traces were shown incorrectly. A prerequisite is that the data of the x-traces are continuous or sorted. Fixed in v2x90. The name of "AT_ampl" was changed to the correct name "AP_ampl". Fixed in v2x90. The read-out of selected values out of the Analysis graph did not work. Fixed in v2x90. The "Cursor Intersection" option of various Analysis functions did not work properly. Fixed in v2x90. SmartLUX is now started as front application. Fixed in v2x90. The Center option did not work when Continuous Redraw was activated. Further the scaling values given in the Oscilloscope were incorrect. Fixed in v2x90. The stimulus was not exported, when the "Export Full Sweep" option was used. Fixed in v2x90. The option "Show Tree Info" was gone. It is now available again in the Display menu. Fixed in v2x90. The "Timer" parameter entry showed nonsense values for parametric data. Fixed in v2x90. The "FileOpened" command was not sent for the equations and the solution base files. Fixed in v2x90. The precedence of operators has been improved. The bit operators have now a lower priority than the boolean operators. For further details please check the PATCHMASTER Reference Manual. Fixed in v2x90.